Free book promotion on Amazon 11/26/2018 - 11/30/2018! 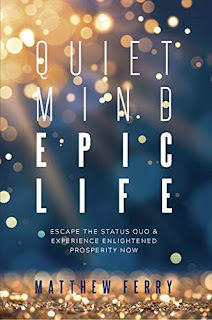 Matthew Ferry presents his Rapid Enlightenment Process inside his new book Quiet Mind Epic Life. Enlightenment is the recognition that the source of life within you… is also the source of life in everyone else… and everything else. We are all one thing expressing itself with infinite variety. When you truly see that the source of life within you is also the source of life in everyone else, and everything else, you enter into an enlightened state. When you see that we are all one thing expressing itself with an infinite variety, and the only thing that makes us different, is our perspective about it…. boom! Everything changes and fear disappears. From this new perspective you rise above the limitations of cultural conditioning. You don’t have to follow the rules anymore. Everything is up for evaluation. You see dogma for what it is, just stories that were made up by well meaning people. But stories none the less. Not valid. Not true. Not real. Finally, you feel free. The invisible barriers disappear. This is what I want for you. This is the promise of Quiet Mind Epic Life.